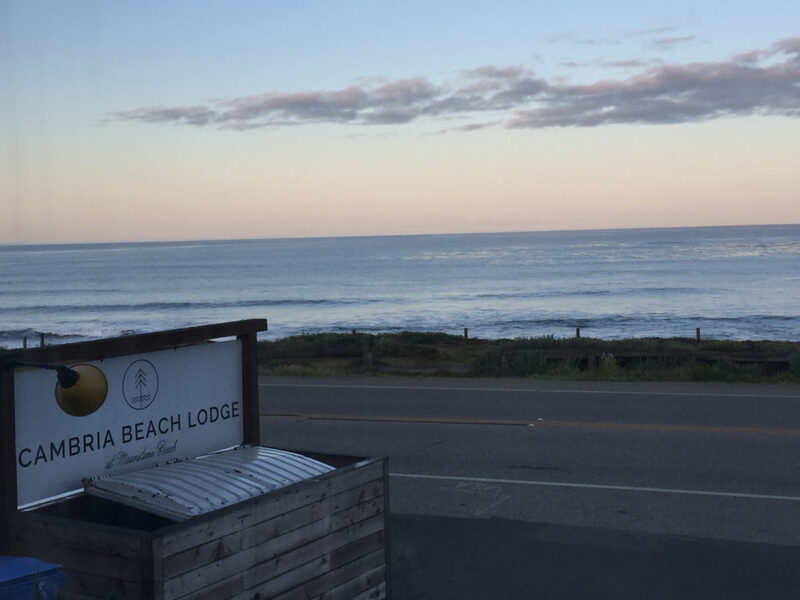 If you are looking for a hotel with thoughtful amenities, comfortable beds and a location across from Moonstone Beach in Cambria, California, book an ocean view room at Cambria Beach Lodge and bask in the beauty of the Central Coast. When our first wedding anniversary was upon us, Andy and I decided that we wanted to do something fun, relaxing and not outrageously expensive. We wanted to celebrate, but we didn’t want to go into crazy debt in order to do it. We also didn’t want to drive more than a few hours, as we knew that we could really only take a couple of days off. With those criteria in mind, we landed on Cambria, California. Cambria, California has long been a favorite place for both of us. 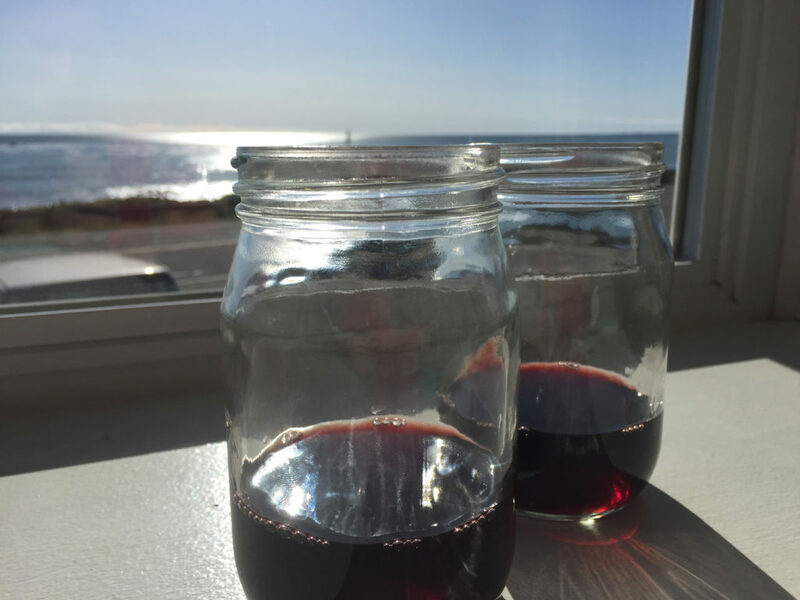 I’ve been there as a solo traveler and as part of a couple, and I can tell you that I have always felt comfortable exploring this charming Central Coast town. Every time I have stayed there, either alone or with Andy, I’ve stayed in the downtown. It’s one of those places where you can park and never move your car again (unless you are going up to Hearst, of course). This time, we wanted something a little bit quieter, and Andy knows I’m a sucker for an ocean view. Voila! Cambria Beach Lodge made it onto our radar. 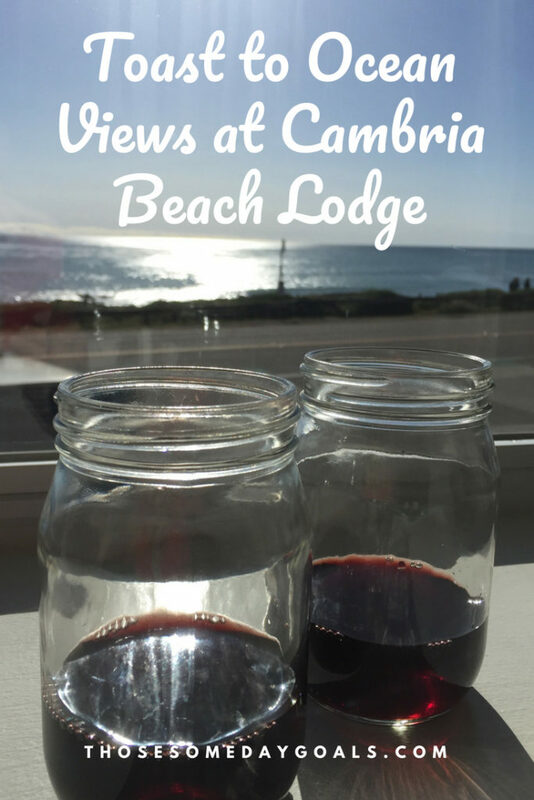 Recently remodeled, Cambria Beach Lodge had everything going for it. It is directly across the drive from Moonstone Beach. It offered a comfortable room with a fireplace and a big window with terrific ocean views. It also offers perks like free continental breakfasts, communal spots for sunset watching and wine sipping (which we took advantage of) and bicycles for exploring (more on that later, but let’s just say I refer to my bike as El Diablo). 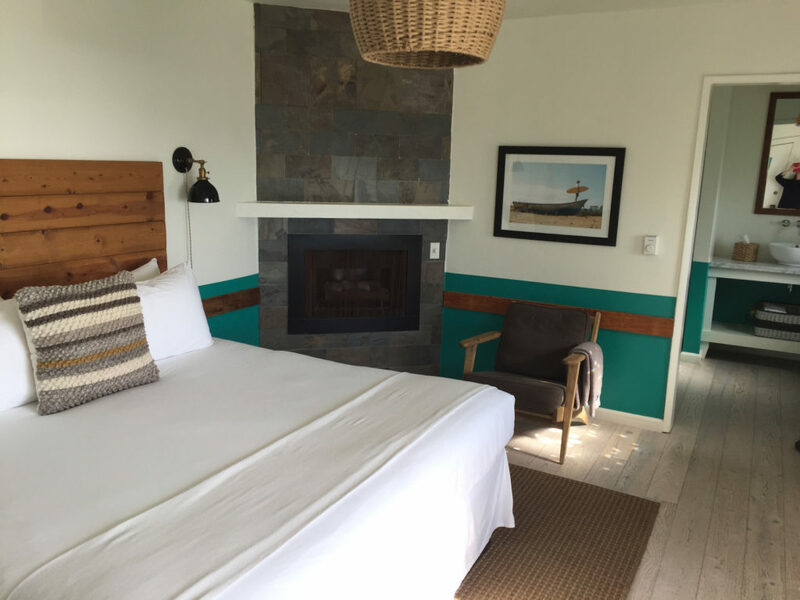 There are times when hotels sound too good to be true, but Cambria Beach Lodge lived up to its description. Even in May the nights get chilly, so the fireplace in the bedroom was much appreciated – it made it so cozy!! The room was spotless (I’m a big stickler for this) and well-stocked. And there is something about a day by the ocean that leads to a sound night’s sleep – of course, the comfy bed helped on that front, too. We loved waking up to the ocean in the morning, and watching the sunsets from our little porch on the Adirondack chairs was incredible. 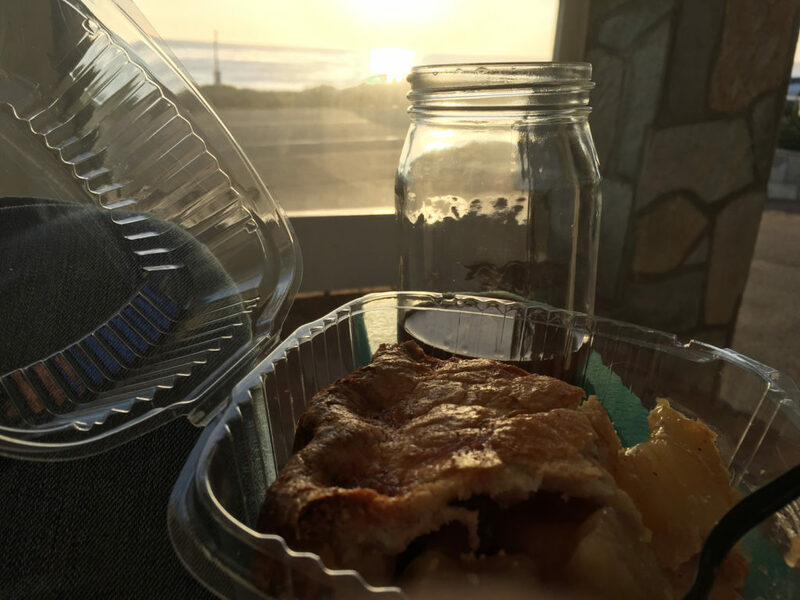 We even managed to incorporate an incredible bottle of wine and some delicious pie from Linn’s (a Cambria must) into the mix. The location made it easy to stroll along the boardwalk, walk down to one of the restaurants and revisit our beloved Fiscalini Ranch Preserve. Were there any downsides? Not having a mini-refrigerator made bringing leftovers back to the room a limited possibility. The Wi-Fi was somewhat inconsistent, and there wasn’t a desk. But that forced us to look outside the room and away from our computer screens. Turns out that wasn’t a negative. We explored every day. We ate way too much and worked almost not at all. In other words, it was the perfect way to celebrate and rejuvenate. Prices: Depending on what time of year you visit, you’ll pay between $170 and $250, with a premium for the full ocean view room. This is such an intimate lodge, and a romantic way to spend your anniversary! Love, love, love that ocean view, it’s so idyllic especially with the sun setting. Your pie and wine combo look delicious! I wouldn’t mind some now. That looks so romantic for an anniversary. I love staying at beach lodges. But haven’t stayed in one like this. 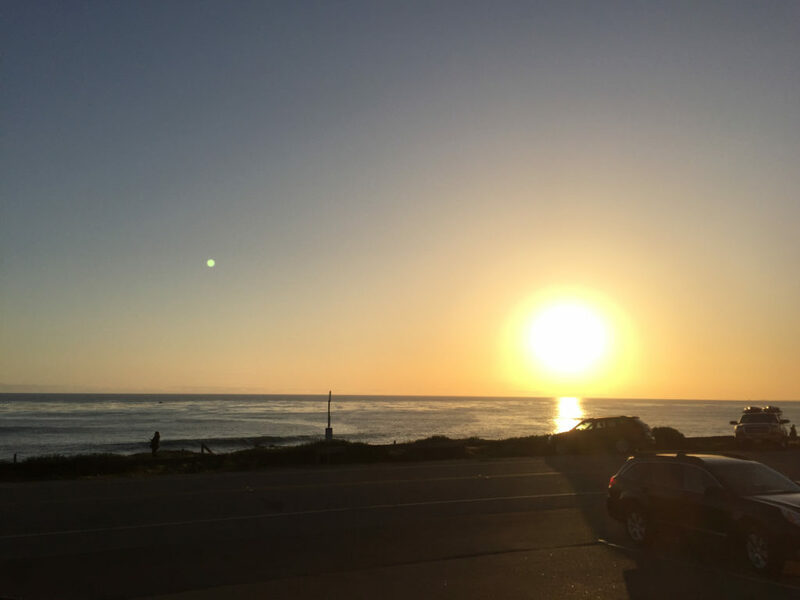 I love the beach and would love to stay at Cambria beach lodge. Thank you so much for sharing. It was perfect — low key with terrific views and super cozy! What a great choice for an affordable and easy anniversary trip. It’s been too long since I’ve visited Cambria and never have seen it with sunshine. Lucky you! You sold me at “fireplace in the room.” I don’t care what time of year it is, coming back from a long day of exploring to a cozy fire is always awesome. 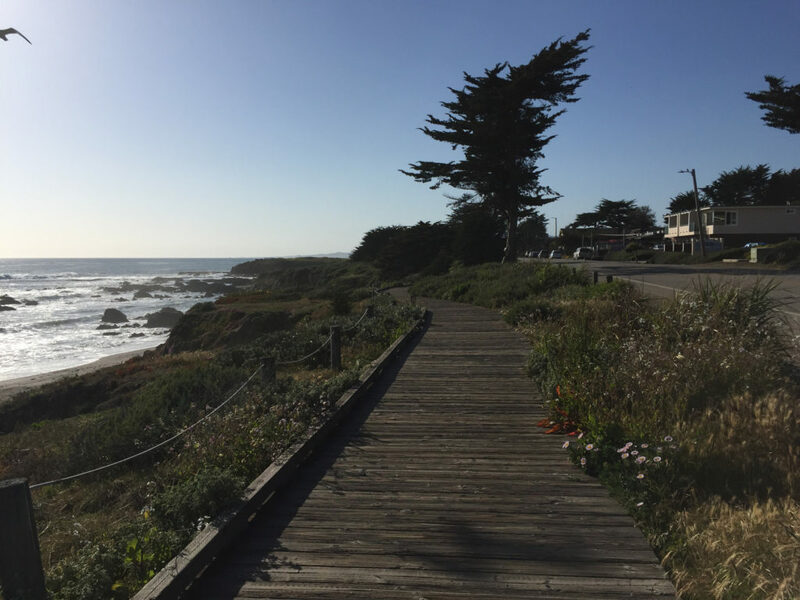 I’ve never heard of Cambria Beach before so thank you for sharing your experience! The ocean views are gorgeous from your room. It looks like a wonderful place to escape even just for a couple of days. Happy Anniversary to you both (belated :D) but really love how simple and so quiet the time spending your anniversary on this lodge. The pure bliss of having the sunset and sunrise. I love the interior too, so simple and suits well to the environment this place is located. To top it all, that view of the ocean from the room is really relaxing to look at. Good romantic spot for an anniversary. I have always found beach lodges exciting. This one seems too good. Your pics are urging me to get to a beach soon. That ocean view makes it all worth it! I love affordable lodging, but that view sets this place apart! Right? That’s the best combination in my book! 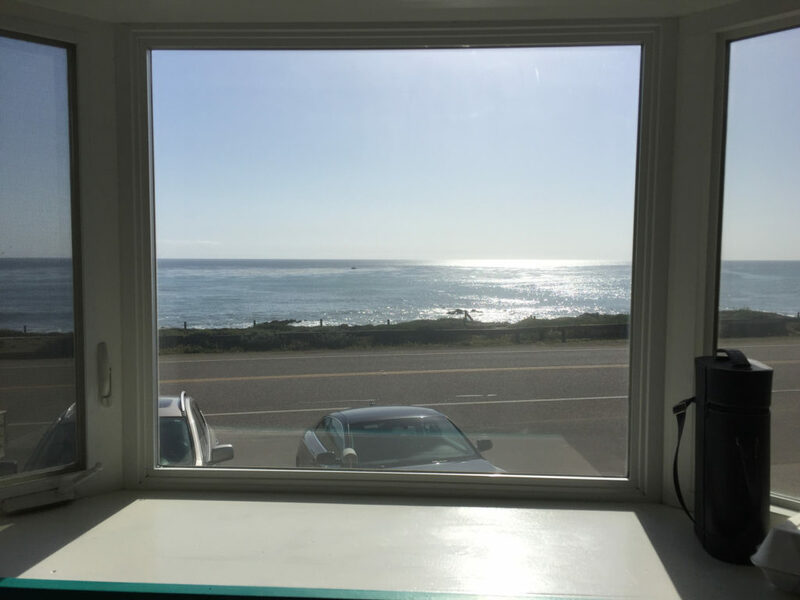 The Cambria Beach Lodge has great views. The price is really reasonable for the ocean view. It is really nice to get out of the hustle and bustle. Fireplace in an ocean view room sounds like s misnomer but I like the idea. The Lodge looks quite comfortable and lovely. Love the ocean views from your room. It would be lovely to hear the waves when you sleep at night. The place promises a refreshing holiday and a memorable one indeed. I’d love to go back! What a lovely way to spend your anniversary. Give me a bottle of wine, a view like that, of the sunset and the sea, and I can relax like that for hours. 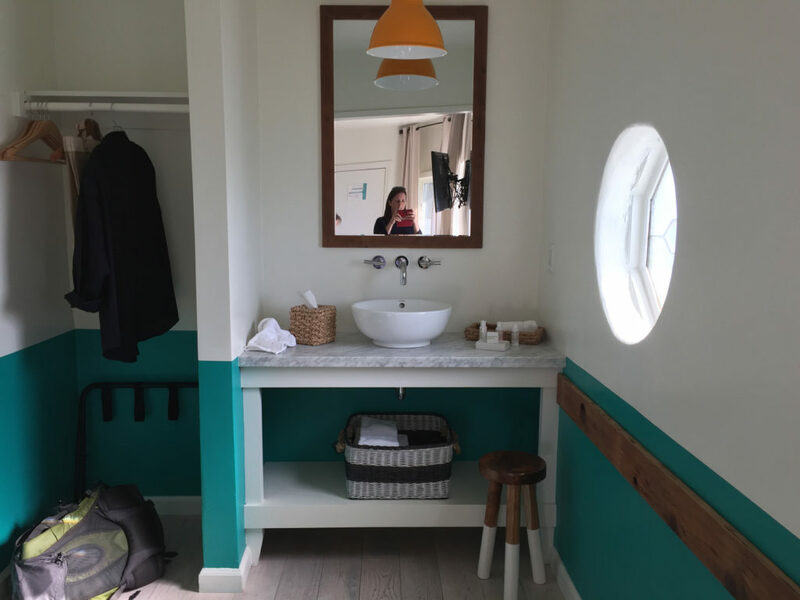 And a wonderful partner – well, icing on the cake 😉 Cambria Beach Lodge looks perfect!